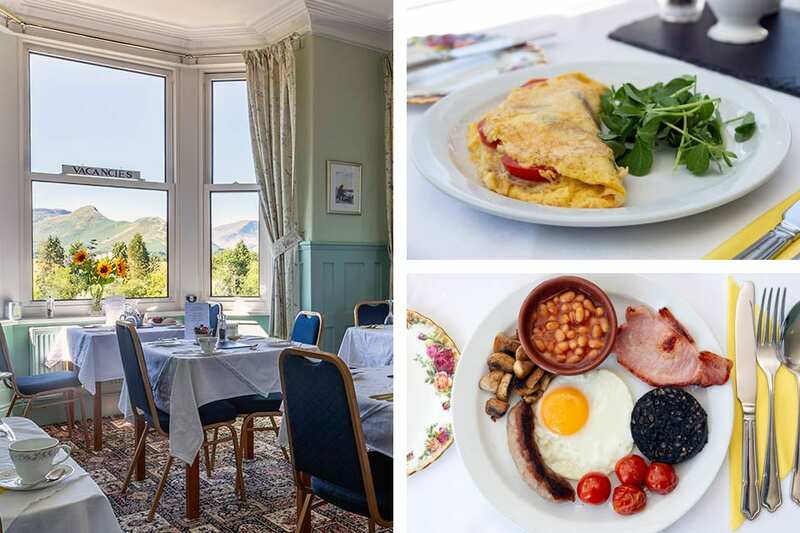 Start your day with a delicious Cumbrian breakfast. Enjoy your breakfast whilst taking in the fantastic views from our south facing dining room. We offer a selection of freshly cooked breakfasts, including full English, omelettes with a choice of fillings and vegetarian options. Cereals, fruit, juices and unlimited tea/coffee and toast are also provided. Earlier breakfast available on request. Selection of Fair Trade tea. Toast and local homemade jams. Bacon, Cumberland sausage, choice of egg, baked beans, mushrooms grilled tomato, black pudding. Quorn sausages, choice of egg, halloumi ,mushrooms, baked beans, grilled tomato. We take real pride supporting the local community and using the finest local produce. Our meat is from Thomasons butchers in Keswick. Our milk, eggs and yogurts are delivered by Steve the Milkman. And we buy homemade jams from the local market which is every Thursday and Saturday. We are more than happy to cater for any special dietary requirements or requests. Please let us know at the time of booking if you would like vegetarian, vegan, gluten free or dairy free alternatives. To help you enjoy your day’s activities we can provide you with a choice of packed lunches from £3.50 each. We can also fill flasks of tea or coffee free of charge. See photos of the breakfast options at Appletrees Guest House. See the full gallery for more photos of our Keswick B&B accommodation.